Today, MBDC celebrates the first ever Platinum Certified Cradle to Cradle product, Highland Craftsmen’s Bark House® Poplar Shingle. MBDC worked closely with Highland Craftsmen to assess and optimize its product to meet Platinum requirements across all five Cradle to Cradle certification categories, including: material health, material reutilization, renewable energy and carbon management, water stewardship, and social fairness. Bark House Poplar Shingles are made from reclaimed tree bark. With artisan craftsmanship, Bark House transforms what was once a waste material into an elegant, handcrafted wall covering for exteriors and interiors. The product is maintenance-free, sustainably manufactured, and is fully recyclable at the end of its use. MBDC is a team of material and product consultants and assessors helping design products for the emerging circular economy. 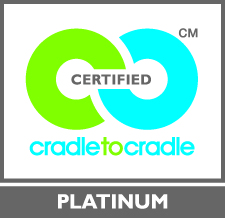 Creators of the Cradle to Cradle Design framework, MBDC applies the multi-dimensional approach to sustainable product design created in the Cradle to Cradle Certified Products Program, which is now managed by the independent non-profit Cradle to Cradle Products Innovation Institute. Highland Craftsmen products with Cradle to Cradle certification are eligible as a path to compliance in Options 1 and 2 of the Materials & Resources credit of LEED v4. Bark House Poplar come in standard-grade singles or in a thicker, premium grade that obtain course, deep furrows and a more pronounced shadow line. Sanded interior-grade shingles are also available. For more information on Bark House shingles, visit BarkHouse.com. Bark House® is a registered trademark of Highland Craftsmen. Nice to see progress, also inspiring! Congrats to all involved people in this development.